Lydiah Litunya raced through the dusty, narrow alleyways of Kayole, a low-income neighbourhood on the outskirts of Nairobi, Kenya’s capital city, towards her friend Sabina Atieno’s house. “My mother, she’s dead!” cried Sabina’s daughter from a crowd of about 20 family members and neighbours who had gathered around the small corrugated iron house. Lydiah in Kayole, her home and the neighbourhood where she is a community health volunteer, traveling house to house to ensure TB and HIV positive patients are receiving the care they need. But Lydiah knew she wasn’t dead. She saw both Sabina’s tuberculosis medication and her anti-retrovirals used to treat HIV scattered across the floor—a lethal combination if not taken correctly. 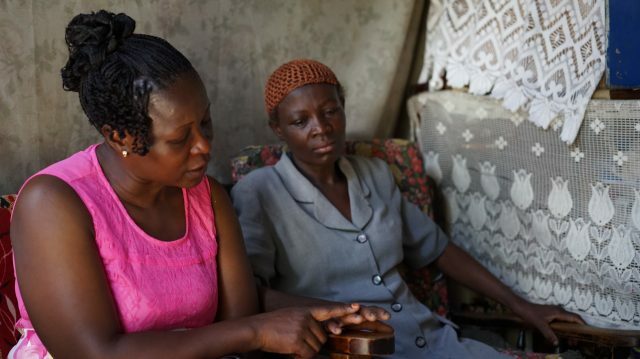 Sabina’s family was about to contact the mortuary before Lydiah intervened and explained the problem. And Lydiah has continued to do so: she helped Sabina swap her HIV medication out for one that would be compatible with her TB treatment, and she’s continued visiting to ensure that she is taking her medication properly and regularly. She also introduced her to a support group for HIV positive women, which has made a world of difference for Sabina. “Together, we’re able to become strong,” she said of her group. Sabina used to hide her HIV status, but now she’s not afraid of people knowing. Lydiah visiting Sabina at home to see how her health is and if she’s still taking her medication properly. Lydiah does all this because she’s a community health volunteer, trained by Malteser International to support HIV positive women, pregnant mothers, and tuberculosis patients. Tuberculosis (TB) is an infectious disease that usually affects the lungs and that can be lethal if left untreated. More than 95 percent of deaths occurred in developing countries. In Kenya, it is the fifth leading cause of death nationwide. People who are HIV positive are significantly more at risk of developing TB, and it is a leading cause of death for HIV positive patients. In 2015, one in three HIV deaths was due to TB. Part of why Lydiah is so good at this job is because she’s from the community where she works—and because she is also HIV positive. Lydiah didn’t always feel like that. She found out she was HIV positive when she was eight months pregnant with her fourth child. Paralysed by the deep stigma of HIV, she avoided telling her doctor, risking transmitting HIV to her child. With the support of her best friend and with treatment from Malteser International, Lydiah got help for herself and her child just in time. Now her daughter is 4 years old and HIV negative. Last weekend, she donned a frilly white dress to be the flower girl in Lydiah’s wedding. Lydiah in the hallway of St. George’s where she has worked for four years with two nurses in the background. The heavy stigma attached to HIV also affects TB treatment. Because the two are sometimes related, people often avoid getting tested for TB for fear they’ll also find out they’re HIV positive. Lydiah’s message to her community continues to be one of openness and disclosure, one that she hopes will eradicate the humiliation association with HIV and TB. When Lydiah was first diagnosed, she would throw her medication away, terrified someone would find out. Now, she takes it openly and in front of other women. Knowing that she is high-risk because she’s HIV positive and because she works with TB patients, Lydiah takes a preventative drug called isoniazid, which helps to keep her tuberculosis-free. Because of the work of organisations like Malteser International and women like Lydiah, the fight being waged against TB is showing a great deal of success: Between 1990 and 2015, the TB death rate dropped by almost 50 percent around the world. The Millennium Development Goal target of halting and reversing the TB epidemic by 2015 was met globally. But Lydiah’s work isn’t done. TAKE ACTION: Tell world leaders to support the Global Fund to Fight AIDS, TB, and Malaria!